A man has been arrested on suspicion of murder after the death of a woman on a dual carriageway in Staffordshire. 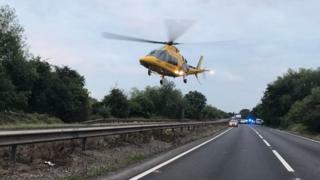 Police said the man, 39, from Hull, had been with her in a van that was pulling into a layby on the A38, near Burton-upon-Trent, on Thursday evening. As the van was driven in, the woman left the vehicle and was hit by a car. An air ambulance flew the woman, who has not yet been identified, to hospital with a number of serious injuries. She was later confirmed dead. West Midlands Ambulance Service said the woman had been in cardiac arrest with head, chest and pelvic injuries after being hit at "high speed" and was taken to a hospital in Coventry. Police officers were called to scene, near the A5121 Branston Interchange and Claymills Road, at about 20:30 BST and shut the road. The northbound side of the A38 is now partially open. Drivers are advised to avoid the area where possible due to delays on nearby routes.